Recently, I entered the Society for Computers and Law Student Essay Prize competition. For the last year in addition to my normal UCL haunt, I had been able to attend LSE and do an Information Technology module, which proved not only interesting but invaluable for this. Here is my highly commended piece, which addressed the question, “To what extent should the functionality, as opposed to the source code, of computer programs be protected by copyright?” Tell me what you think! This piece from Lorraine Chimbga was a runner-up in the SCL Student Essay Prize competition. It addressed the following topic (from a range of suggested topics): To what extent should the functionality, as opposed to the source code, of computer programs be protected by copyright. This discussion will first explore the ideas presented by John Perry Barlow in his classic essay, ‘The Economy of Ideas’. This is done so as to provide an alternative background to the question in order to inform us as to why it is important to recognise that protecting the functionality rather than the source code of software is vital to reconsidering our traditional conception of economic value; copyright protection may no longer be appropriate. I will then discuss the three central English cases in light of this and explore why it is vital that we find alternative ways of protecting the value in software which, in my opinion, does not reside in the source code but the functionality or in other words the ‘look and feel’ of the results that the code produces. ‘The Economy of Ideas’ may have been written at the dawn of the internet but this insightful paper about the problems of applying classical notions of intellectual property rights (IPR) to the digital age, seems to hold true today. When one looks at the way in which the English courts have decided and developed the three main software cases one can see that Barlow was almost acting as a seer for the future digital age and the dangers of not appreciating the weight of its new currency: information. He recognized that its unique nature would require a move away from the old legal conceptions if we were to continue to be able to protect ideas effectively in the new digital world. Barlow’s main thesis was that information wants to be free. As a result, the traditional approach and understanding of IPR in the Information Society would not exist much longer due to the very nature of Information. He conceived it as a natural life force that could not be contained like a wild beast of nature. Unlike the old conception of IPR where protection was attached to the physical thing, when it concerns information in the digital society, the wine no longer needs the bottle because it freely flows. Particularly in relation to software, one can see the truth of his warning that, despite the ‘fierce grip’ of the old legal structure, the way in which companies trade in information would have to change otherwise they would increasingly find that the courts were unable to deal sensibly with technological issues. As a result, disputes would increasingly have to be settled out of court since verdicts would not be predictable enough to be supportive of long-term enterprise. Barlow urged us to therefore reconsider our approach to the reward and protection of ideas in this unique wilderness by instead adopting alternative models of distribution rather than relying on traditional copyright as the mechanism of control. Although it is clear that the software industry continues to thrive, Barlow’s insightful prediction seems to hold particularly true in light of the three main cases that have helped to develop the English line of case law. Copyright has been the expansive platform through which one’s creative expressions have been protected. Historically, IPR attached to physical objects for example, although the protection was of the words, one would attach a notice of copyright to the physical book and control its production. The problem now lies in the fact that computers are machines which were designed to make copies. They can easily reproduce information and, due to this ease, it is cheaper and relatively easy to reproduce and distribute whatever they copy. Once making a copy required permissions and at times the use of difficult methods, meaning that as a form of protection copyright easily lent itself to owners being able to protect and enforce the exclusive right to control derivative works. 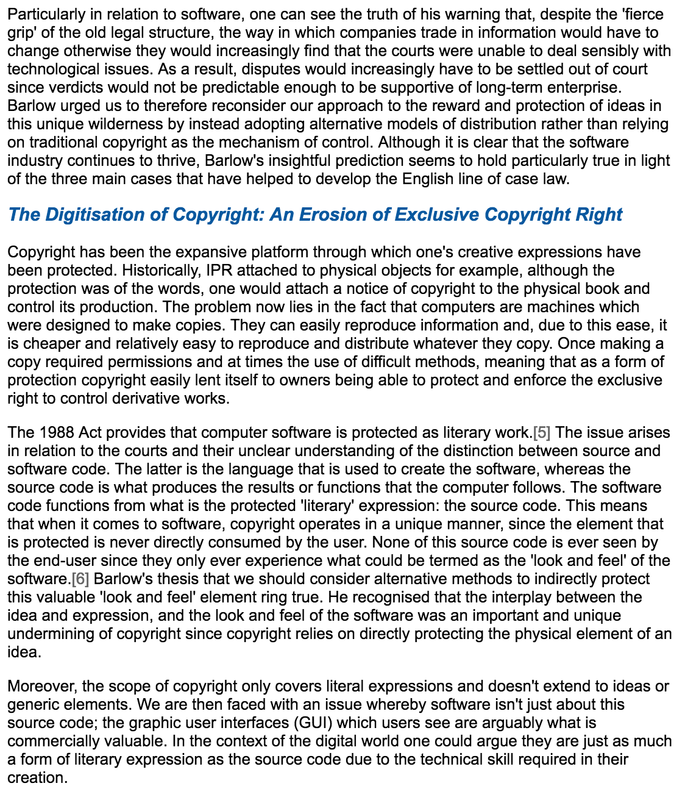 The 1988 Act provides that computer software is protected as literary work. The issue arises in relation to the courts and their unclear understanding of the distinction between source and software code. The latter is the language that is used to create the software, whereas the source code is what produces the results or functions that the computer follows. The software code functions from what is the protected ‘literary’ expression: the source code. This means that when it comes to software, copyright operates in a unique manner, since the element that is protected is never directly consumed by the user. None of this source code is ever seen by the end-user since they only ever experience what could be termed as the ‘look and feel’ of the software. Barlow’s thesis that we should consider alternative methods to indirectly protect this valuable ‘look and feel’ element ring true. He recognised that the interplay between the idea and expression, and the look and feel of the software was an important and unique undermining of copyright since copyright relies on directly protecting the physical element of an idea. Moreover, the scope of copyright only covers literal expressions and doesn’t extend to ideas or generic elements. We are then faced with an issue whereby software isn’t just about this source code; the graphic user interfaces (GUI) which users see are arguably what is commercially valuable. In the context of the digital world one could argue they are just as much a form of literary expression as the source code due to the technical skill required in their creation. The courts have been unable to elucidate a principle that effectively meets the need to protect the ideas that go into the creation of software rather than just the source code. In other words, the courts have abstractly applied copyright perhaps due to a limited understanding of the way the digital environment works by protecting the ‘written’ language that performs the function, rather than what is commercially valuable to creators: the look and feel of their software. It is submitted that the English line of cases do not necessarily reflect the commercial reality and value of the way in which software is visually presented. It is clear to see that the scope of copyright is limited in the way that it only covers literary works. The courts’ attempts to interpret the outdated legal structure in light of the digital world has raised problems in the English line of cases involving software. In Navitaire, EasyJet designed their own software based on the OpenRes system owned by Navitaire. Although EasyJet specifically requested that the look and feel of Navitaire’s software be copied, the key element in the case was that EasyJet’s developers never copied Navitaire’s original source code. 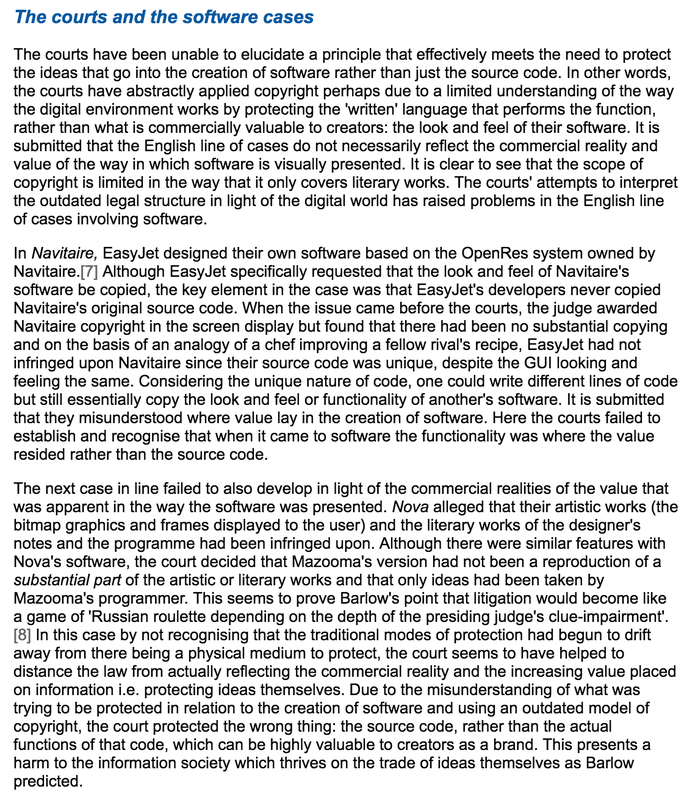 When the issue came before the courts, the judge awarded Navitaire copyright in the screen display but found that there had been no substantial copying and on the basis of an analogy of a chef improving a fellow rival’s recipe, EasyJet had not infringed upon Navitaire since their source code was unique, despite the GUI looking and feeling the same. Considering the unique nature of code, one could write different lines of code but still essentially copy the look and feel or functionality of another’s software. It is submitted that they misunderstood where value lay in the creation of software. Here the courts failed to establish and recognise that when it came to software the functionality was where the value resided rather than the source code. The next case in line failed to also develop in light of the commercial realities of the value that was apparent in the way the software was presented. Nova alleged that their artistic works (the bitmap graphics and frames displayed to the user) and the literary works of the designer’s notes and the programme had been infringed upon. Although there were similar features with Nova’s software, the court decided that Mazooma’s version had not been a reproduction of asubstantial part of the artistic or literary works and that only ideas had been taken by Mazooma’s programmer. This seems to prove Barlow’s point that litigation would become like a game of ‘Russian roulette depending on the depth of the presiding judge’s clue-impairment’. In this case by not recognising that the traditional modes of protection had begun to drift away from there being a physical medium to protect, the court seems to have helped to distance the law from actually reflecting the commercial reality and the increasing value placed on information i.e. protecting ideas themselves. Due to the misunderstanding of what was trying to be protected in relation to the creation of software and using an outdated model of copyright, the court protected the wrong thing: the source code, rather than the actual functions of that code, which can be highly valuable to creators as a brand. This presents a harm to the information society which thrives on the trade of ideas themselves as Barlow predicted. What followed was the complex case SAS Institute whereby SAS developed their own software which allowed users to develop their own programmes in the SAS language.However, if customers wanted to switch from SAS, it was a costly and difficult task. World Programming created their own software which could execute SAS-based apps by emulating the platform as closely as possible. Again like the preceding cases, there was no suggestion that World Programming had access to the protected source code or that they had copied any of the structural design. SAS raised three important questions: (i) the extent to which copyright protected ideas, procedures, methods of operation and mathematical concepts were distinct from those expressions; (ii) the extent to which copyright protected the functionality and interfaces of computer programs and the programming languages in which they were expressed; and (iii) the test to be applied to determine what amounted to reproduction of asubstantial part in cases such as the instant case. Initially, Arnold J ruled that the 1988 Act would only interpret protection as being for ‘expressions’ and not ‘ideas, procedures, methods of operation and mathematical concepts’ since this would be wandering into the realm of patent. When the case was sent to the EU court, they also confirmed that you could not protect the language used to create software and that so long as direct replication or extraction of the software code did not take place, studying the software to create your own version was permissible. One could argue that allowing such study is conducive to the continuing innovation of software through competition. However, it again misses the great point outlined by Barlow that the commercial value in the information age now lies in the expression of ideas themselves. This holds particularly true for software; the value isn’t necessarily concentrated in the source code. One could argue that being able to write in the different computer languages such as Java, HTML, C+ etc. is a skill and it is here submitted that these are new forms of creative expression themselves. The courts not affording protection for ideas due to a strict adherence to an outdated form and conception of what expression is has meant that the case law that is supposed to afford protection could not be further from the commercial reality even if it tried. 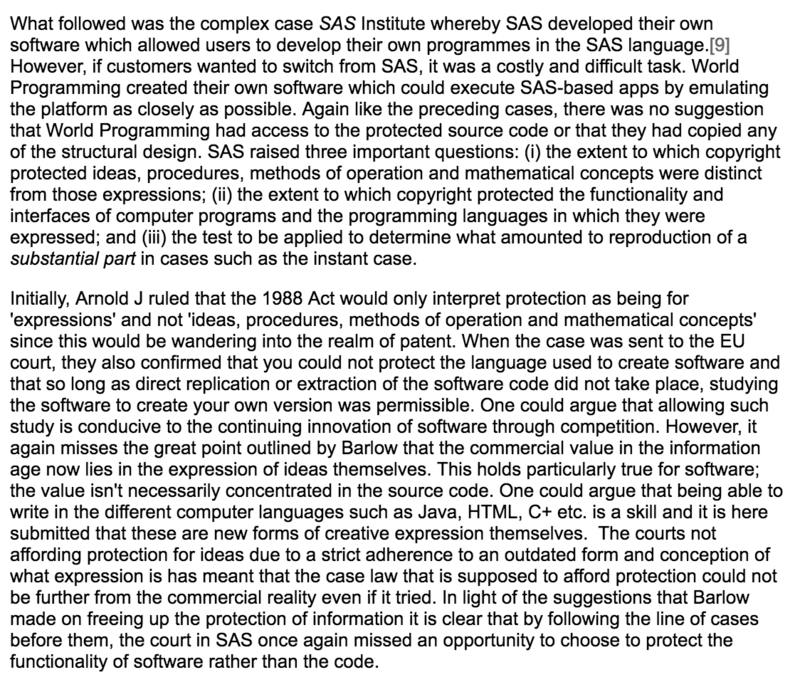 In light of the suggestions that Barlow made on freeing up the protection of information it is clear that by following the line of cases before them, the court in SAS once again missed an opportunity to choose to protect the functionality of software rather than the code. Whilst the aims of copyright and patent may be correct, they are limited in their ability to handle the issues posed by computer technology. The law will have to be further modified to accommodate computer-related invention. Alternatives need to be found that balance the need to protect the exclusive rights of the software copyright holder with encouraging continuing creativity and innovation, whilst also balancing with it the needs and expectations and everyday practices of those who live in the information society – consider the ease with which consumers pirate software. Barlow, similarly to Lessig, suggests, that protection for ideas may not lie within the law, rather that the architecture of cyberspace may lend itself to the protection of ideas online. He argues that, in the absence of objects, value will be based more on relationship than possession. In light of Barlow’s essay, it is clear that the cases missed an opportunity to recognise and develop alternative methods of protection. For example, to allow software to wander into the realm of patent law might perhaps have been a chance to develop a hybrid form of protection that recognises the unique nature of software and the need to protect the functionality (or the look and feel), which isn’t currently protected, rather than just the source code. Alternatively, rather than striving to protect software through a hybrid of patent and copyright law, creators could instead focus on the unique nature of information and their relationship with the market. Mainly that, if you offer a good enough product for free, people are likely to pay for the most relevant and reliable source of the information. In conclusion, by looking at the three main cases discussed, one can see that the courts have developed a principle whereby the source code (which only developers ever see) is protected, however the visual representation of the software (where the true value arguably lies) is left to fall into the cracks between copyright and patents or to be left entirely unprotected. As long as one doesn’t directly copy this source code but creates software that looks and feels like the software of another, this seems to be permissible. Clearly, not only are we protecting the wrong thing when it comes to software, but copyright law doesn’t work well as a device for preserving value and ideas for property in the digital age where information can be infinitely reproduced and instantaneously distributed at relatively low costs. We need to be able to reconsider or even come up with a new way of offering protection for the exclusive rights one has over their property whilst also appreciating the unique nature of the digital world and realising that value lies in different places to the traditional physical world. For software this means the functionality should be protected more than it currently is.